DraftKings is an online provider of daily fantasy sports games that is based in the United States. DraftKings welcomes all new clients with a free entry into a real money tournament, the ability to earn Frequent Player Points that may redeemed for more free entries, participation in the refer-a-friend program that can earn you money, plus cash back refunds, freerolls, and more. DraftKings is 100% legal – and this is according to the US federal government! – and gladly accepts USA, UK and Canadian players. To receive all the benefits mentioned above, simply register a new account at DraftKings and make a deposit of at least $5! If you do not yet have a valid DraftKings account, then click here to register visit DraftKings. YOU DO NOT NEED TO ENTER PROMO CODE! All the player incentives available to new customers will automatically be granted to your account once you sign up through any of our links or banners! The next step is to make your initial deposit. The minimum deposit amount is $5, but to maximize the deposit bonus, you’ll need to deposit $600. Of course, feel free to deposit any amount you feel comfortable between $5 and $600! Note that bonus money is not awarded immediately to your account, but instead the bonus dollars are released incrementally as you earn Frequent Player Points. 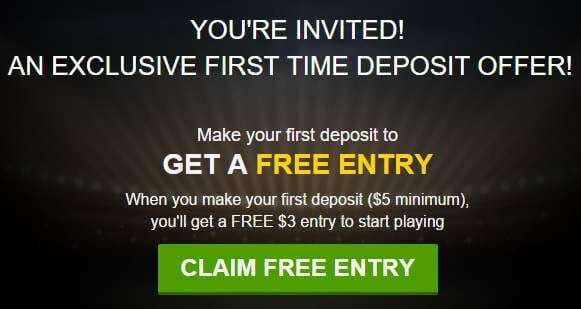 The $5 minimum deposit applies to all deposit methods, and DraftKings does not charge any fees for any of the deposit methods currently available. The online e-wallet payment options currently supported are PayPal and Dwolla. DraftKings also accepts all major credit cards and debit cards, including those from American Express, Discover, MasterCard and Visa. DraftKings also accepts all prepaid cards and gift cards backed by those aforementioned companies. Note that if you do choose to use a prepaid card, it is crucial that you hold onto it because that is where DraftKings will post your withdrawals! When you make your first deposit, DraftKings will match that amount as your maximum POTENTIAL cash back refund, up to $600. As previously mentioned, you do not immediately receive this bonus upfront, but must earn it as you play real money contests. 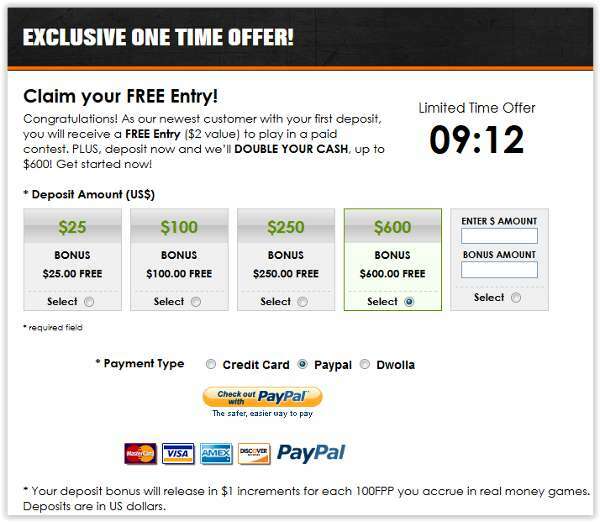 The pending bonus is equal to the amount of your initial deposit, up to a maximum $600. DraftKings awards that bonus to you at the rate of $1 per 100 FPPs earned. FPPs are earned every time you pay a buy-in for any DraftKings contest. The rate at which FPP is earned varies across events, which can make it a bit confusing for newcomers, but the average payout is about four FPP per dollar spent. Therefore, the average user will have to stake a total of $15,000 in order to clear the maximum bonus of $600. Note that FPPs are accrued, and clearing bonus money does not affect that accrual. Once a player has accrued 6,000 FPPs, he or she can then use those points at the DraftKings store to purchase buy-ins to various events. A conservative average is that you earn $25 in buy-in potential for every $350 spent, which helps to mitigate that wagering requirement. If you staked the $15,000 or so needed to clear the $600 bonus, you would also earn approximately $1,100 worth of buy-ins. When bonus money is awarded, DraftKings deposits it into your account as a cash bonus. That means that you can use it however you like. DraftKings does not stipulate that you must use the bonus money on its contests, but if you choose to, all of the contests available are valid. If you earn the maximum $600 bonus and want to enter 600 $1 games, you can do that. You can also enter one daily league with a $600 buy in. Bonus money is released to you as cash in your account. At that point, you are free to do with it as you please, including withdrawing it, and there is no penalty for doing so. DraftKings is always offering new and seasonal promotions and events. At the beginning of the NFL season, you can get a free entry into a $100K football contest. Additionally, DraftKings usually hosts reload bonuses at the start of each sport season. That bonus is usually worth 50 percent of your deposit, sometimes as high as 100 percent and never any less than 25 percent (of course, there is a set maximum bonus amount that you can earn). Read our full DraftKings review here. 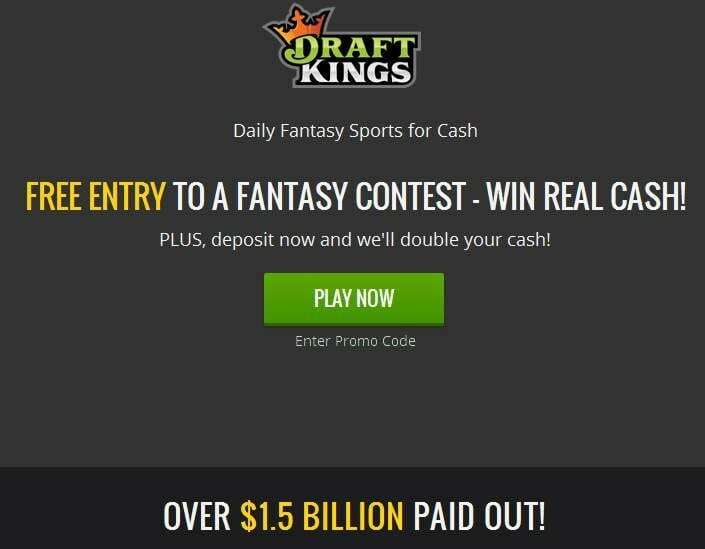 Sign up to DraftKings today! For more information, you can read about the DraftKings promo code and welcome bonus here. Also read this comprehensive DraftKings review and then check out their free fantasy football tools to help you draft a better team! Is DraftKings legit? Read the DraftKings review at LegitOrScam.org to find out! Read more about the DraftKings bonus code here.